We basically live in the woods. From the farthest corner of our back deck, you can toss food scraps right into our woods. I am not really prepared to publicly admit that we do this after just about every meal, and that when we clean out our fridge we just walk onto the deck with all our containers and chuck it all, or that we have contests to see who can throw things farther, or who can smash rotten tomatoes onto the big log in our swamp or anything. But I will say that the vegetation over in that area is really flourishing, like it's all being somehow veritably showered with foodstuffs that will fertilize it. Hypothetically speaking, of course. Well it is cold out, and wet and icy and not fun to go running out into the yucky wintery weather so often. And we can't throw wet stuff like food scraps into our garbage anymore, because we use corn-based BioBags that will start to break down right in our trash can if they get too much moisture in them. 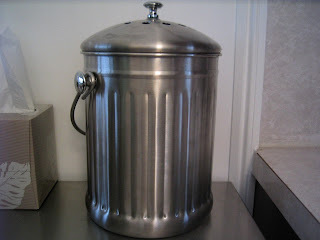 So a couple of months ago it finally occured to be to just get a kitchen compost container, and shortly therafter the Norpro 94 Stainless-Steel Composter Keeper came to live with us. I pretty much adore it. I read the reviews, read that they really don't smell and that this model's lid is easy to lift on and off and doesn't get stuck. It was all true. The little filters in there are great, you really can not smell the stuff in there at all. Even when you open it up to put more in, you'd expect the odor of the stuff that's been in there a few days to puff out like a stench-cloud, but it doesn't. It's like the filters block the air enough to somehow keep the scraps from decomposing and getting all smelly. Now we only have to take our hillbilly trek to the back of the deck once or twice a week. It would be great to start some well-managed composting going back there instead of just a pile in the woods. We're not quite there yet, though.